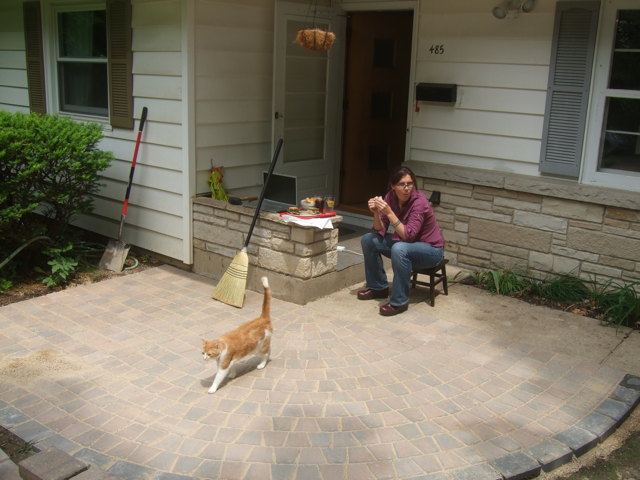 We built a patio of formed paver stones on a foundation of sand over compressed gravel. 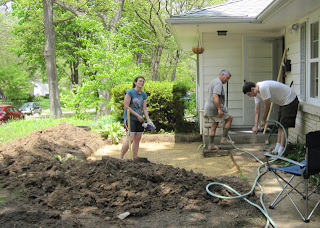 First we dug the foundation. We removed a patch of cultivated flowers and other plants which previously grew in that space, plus some grass. We dug out the hole to a depth of about 6 inches, using shovels and a pickax. It turned out that the pickax was by far the most useful tool, used to scrape the dirt to the correct level, and carve out the edges. Once the hole was dug, we installed the foundation made of compacted gravel. We poured gravel into the hole using a wheel barrow. 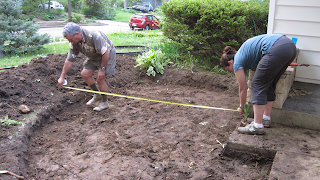 We tamped it by hand using an 8-inch square tamping tool. We used a four-foot level to make sure the bottom was fairly flat and fairly close to a two-inch height drop across the 8-foot width of the patio. Later, when sand and stones were delivered at the same time, the gravel was covered in sand. The sand, also, was brought in by wheel barrow. I (alone, henceforth) spread it with a flat-front shovel, making it approximately smooth. Working from borders toward the center, the sand was spread using flat tools, such as boards. 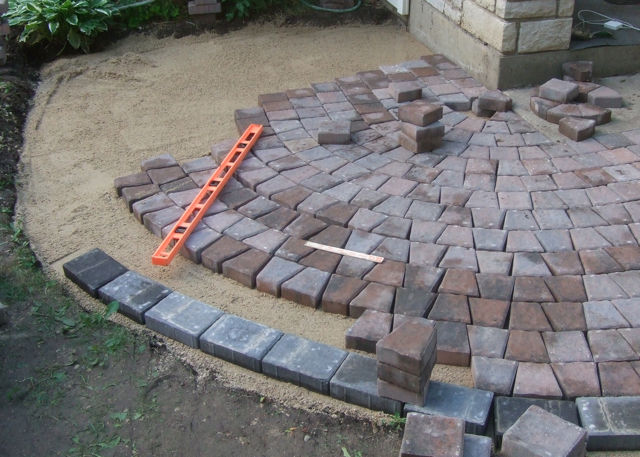 The sand was spread to a thickness such that the paver stones would be flush with the adjacent sidewalk slabs. There are a lot of tricks to getting the sand perfectly sloped, but no tricks were used in this project. I was just very careful and checked the slope over and over and over again. I tamped the semi-wettened sand to help it maintain its structural integrity during the tamping and subsequent stonelaying. Next, I laid the bricks. I laid out the stones in the approximate pattern. As I laid out the pattern, I adjusted stones to account for the available stones, and to make the overall pattern more consistent. For instance, the curves use consistent and predictable patterns of trapezoidal and square stones. The outer perimeter uses a different color of stone, for contrast. Amazingly, I had exactly the right number of square and semi-square stones; at the end, I had one square stone left over. After all the stones were perfectly in place and level, I swept sand over their tops to form a tight lock between individual stones, which helps keep them altogether in place. The end result looks very nice and adds a lot of curb appeal to our overall house. The patio is one part of a makeover to the front of my yard. Stay tuned for more projects: a natural-stone path across my yard leading to the patio and the front door; a path of paver stones around the right side of the house; new grass; and more! we have direct access to stone of unmatched beauty and rarity and with over 25 years of building experience, in-house architect and a complete supply, design and installation service. We can then advise you on a suitable stone for your project, ensure the quality and therefore provide you the best value for your natural stone choice.